Seven Days writers can't possibly read, much less review, all the books that arrive in a steady stream by post, email and, in one memorable case, a gaggle of geese. 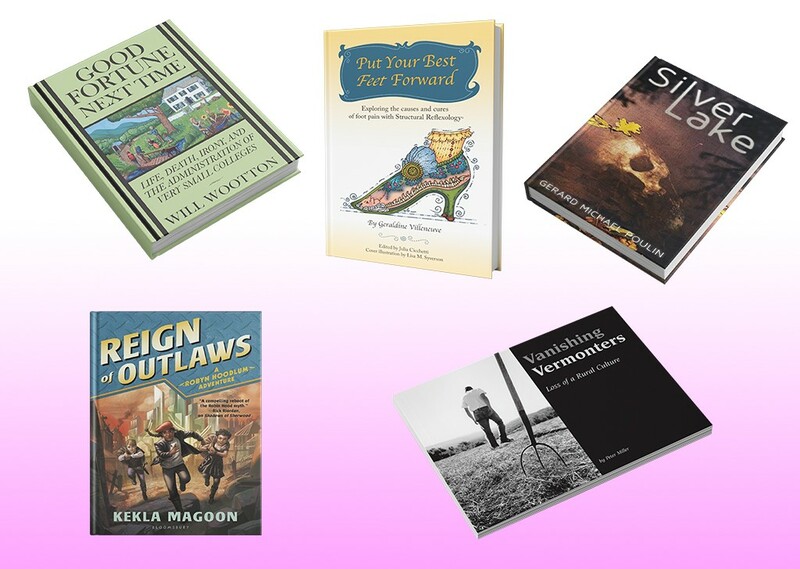 So this monthly feature is our way of introducing you to five books by Vermont authors. To do that, we contextualize each book just a little and quote a single representative sentence from, yes, page 32. Kekla Magoon, Bloomsbury Publishing, 272 pages. $16.99. [Merryan] drew a deep breath, reminding herself that others, like Robyn, had already lost everything. In the third and final installment of Kekla Magoon's adventurous retelling of the classic Robin Hood tale, middle-grade readers find Robyn Loxley on a desperate mission to save her missing parents. But what starts as a personal quest turns into something greater, as she is thrust into a leadership role in the rebellion against the cruel governance of her friend Merryan's uncle, Ignomus Crown. Given the mythology of the trilogy, which involves mysterious "moon lore" and more conventional dystopian tropes — a militarized police force, checkpoints, tent cities, concrete fortresses, holograms — readers may get more pleasure out of reading the books in sequence. But, given the fast pace and general sense of excitement in this series by a NAACP Image Award winner and Vermont College of Fine Arts faculty member, Reign also stands on its own. Peter Miller, Silver Print Press, 168 pages. $44.95 hardcover, $24.95 paperback. On the day of the sale, the state sales tax people came down and said he owed them $300,000 in sales tax, declaring what he sold did not come under agricultural exemption. Earlier in his career, New York-born Peter Miller took pictures of international celebrities, Paris street scenes and current events for LIFE and other magazines. To those who've known him over the past few decades, however, Miller seems born to document Vermont — specifically, its disappearing way of life. His 1990 coffee-table book Vermont People came first; A Lifetime of Vermont People, Vermont Farm Women and other volumes followed. Now, at age 83, Miller has released Vanishing Vermont: Loss of a Rural Culture. It contains 24 interviews with Green Mountain State residents, from the well known to the obscure. Along with their black-and-white portraits, Miller includes evocative scenes: a collapsed barn, a barefoot farm girl, a pickup loaded with freshly killed deer. The interviewees offer unvarnished and often bitter commentaries on modern Vermont. While acknowledging the inevitability of change, they seem collectively to question the direction and pace of "progress." Gerard Michael Poulin, Christopher Matthews Publishing, 259 pages. $16.95 paperback; $2.99 ebook. Because his head was drooped forward, she thought the older passenger to be asleep. In this small-town crime thriller by Barre native Gerard Michael Poulin, it's safe to assume that a limp body is actually a corpse until proven otherwise. Set in central Vermont in 1959, the story opens with young schoolteacher Tom Farrell picking out a coffin for his late father; while he's inside the funeral home, his longtime nemesis, Bob Faith, cuts his brake line. Tom survives the sabotage, but the sociopathic Bob, having gotten a taste of murder, decides to sample the full menu. Meanwhile, debt-ridden Tom resorts to an insurance scam that takes advantage of a desolate spot on the real Barnard lake of the title. Bankers, hit men, desperate dames — no one's innocent in this twisty tale, written in a hard-boiled, just-the-facts style that harmonizes with its midcentury setting. Geraldine Villeneuve, Balboa Press, 180 pages. $13.99 paperback; $3.99 ebook. Chronically raised heels create an imbalance of the long foot muscles that propel and assist in balancing the body while moving, throwing the entire body out of kilter. In August, medical journal BMC Public Health published an article on the impacts of wearing high heels. Synthesizing the results of more than 50 studies published in seven languages through 2016, the authors discovered what many women already know: High heels can make them more attractive to men — and damage their bodies. In Put Your Best Feet Forward, Geraldine Villeneuve, a Jericho-based certified reflexologist and massage therapist, describes the reciprocal relationship between foot health and overall health. She reviews the history, theory and practice of reflexology and draws on more than 30 years of experience to offer case studies. In her view, the foot is a mirror and microcosm of the body, and reflexology offers preventive, diagnostic and curative value. Reading this book is likely to inspire many a woman to ask whether catching his eye with those stilettos is really worth it. Will Wootton, Mandel Vilar Press, 288 pages. $17.95. "Tell me, everyone, if you would, if you are comfortable..." he said, looking at each of us, "how much money did your endowments lose?" Who mourns for Windham College? Or Mark Hopkins College, or Trinity? Why did those Vermont schools bite the dust while Sterling and Marlboro survived? Few are better qualified to elucidate the life (and death) cycles of teensy private colleges than Will Wootton of Craftsbury Common, a former Marlboro administrator and president of Sterling from 2006 to 2012. Now retired, he presents the fruit of his experiences not in a textbook manner but as a freewheeling memoir woven from anecdotes of both his professional and personal lives. Wootton's quippy, no-holds-barred account won't make his legacy any less controversial; "Some people are terrifically angry at me in this state," he told the Associated Press in 2009. But it's way more fun than you'd expect from a study of nonprofit administration. Being a college president, Wootton writes, reminded him of working in a busy restaurant kitchen: "It's all fear and the gripping excitement like a rollercoaster."